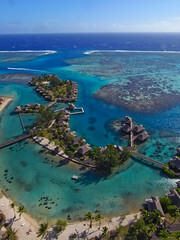 The InterContinental moorea Resort & Spa just completed a 7 months and 10 millions Euros refurbishment program and just reopened a few days ago. Since I am working for this resort it was a good pretext to spend the week end there and KAP the new swimming pool. 20-25 knots was almost enough to lift the Nikon D40x with a kiwi PFK Nighthawk but it was quite bumpy and Heidy my “KAP risk manager” thought it was wiser to go with the Ricoh GX 200, which of course I did!